Moist and tender spaghetti squash croquettes served with a lemon sauce for the perfect balance of sweet, salty and acidic! “There’s spaghetti squash in here? These croquettes are amazing!” said Ben. “Um, just a little. About 75% of each croquette is spaghetti squash boo” I replied. I think it’s great that once again I managed to turn a vegetable Ben isn’t too fond of, into a dish he can’t stop eating. Every time this happens I feel so proud of myself because it means I’ve successfully transformed an ingredient into a dish most people will enjoy eating. I also had a lot of fun creating this dish because it’s a mash up of two of Pickled Plum’s most popular recipes. A few years back I published a spaghetti squash with mushrooms and parmesan recipe that blew up on the internet. It’s been featured in just about every spaghetti squash recipe roundup you can find and continues to be one of the top recipes on my blog. 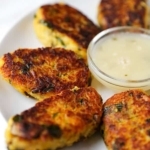 The second recipe that’s been getting lots of attention is my recipe for salmon croquettes. 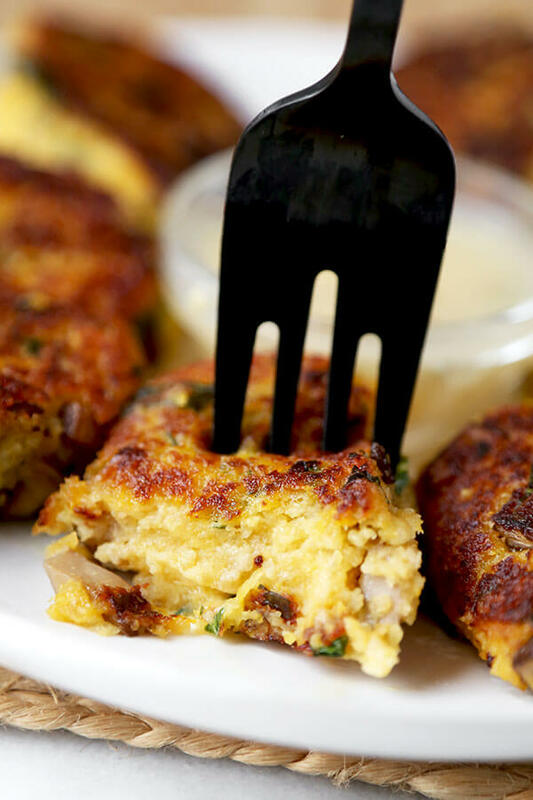 I’ve received so many positive comments on both dishes that I thought it would be fun to fuse them together and create a delectable spaghetti squash and mushroom croquettes! My biggest fear when I created this recipe was that the spaghetti squash would be too watery, making the mixture too mushy to shape into nuggets. Then I thought about the trick I use when making zucchini cakes – remove the excess liquid with paper towels. This soaks up the water and makes the spaghetti squash more compact and dry. 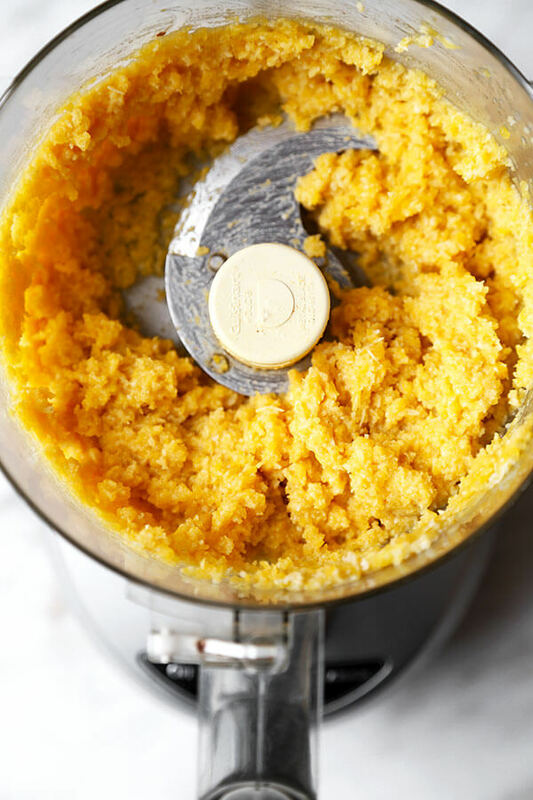 The spaghetti squash then briefly pulsed in a blender with breadcrumbs, parmesan cheese, an egg, worcestershire sauce, salt and pepper and transferred to a bowl. I cooked the mushrooms separately since I wanted them to have a nice golden brown color. Plus, mushrooms are also very watery so frying them in a pan removed a lot of the moisture. 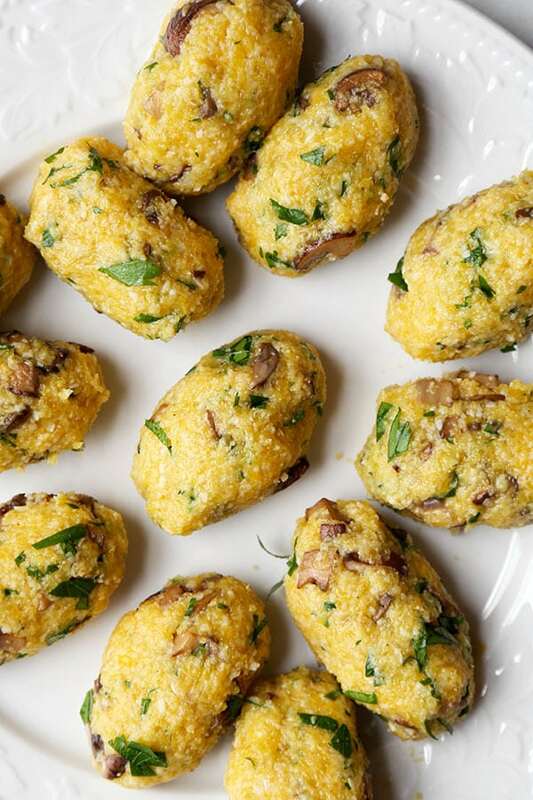 I added them to the spaghetti squash along with chopped flat leaf parsley and shaped the mixture into 12 croquettes. The last step is to fry them in a pan for about 5-6 minutes on each side and tada! Dinner is ready. Easy peasy and yummy! I’ve made a quick lemon sauce to go with the spaghetti squash croquettes but this is totally optional. The croquettes on their own are packed with so much umami they don’t need any additional flavors. However, if you are someone who likes savory foods you will prefer them with the sauce. The natural sweetness of the spaghetti squash may throw you off a bit – pairing them with the tart and salty lemon sauce will hit the spot. This is a wonderful recipe for kids too. This is a wonderful recipe for kids too. You can feed them a healthy meal without them knowing that the croquettes are mostly made of vegetables! 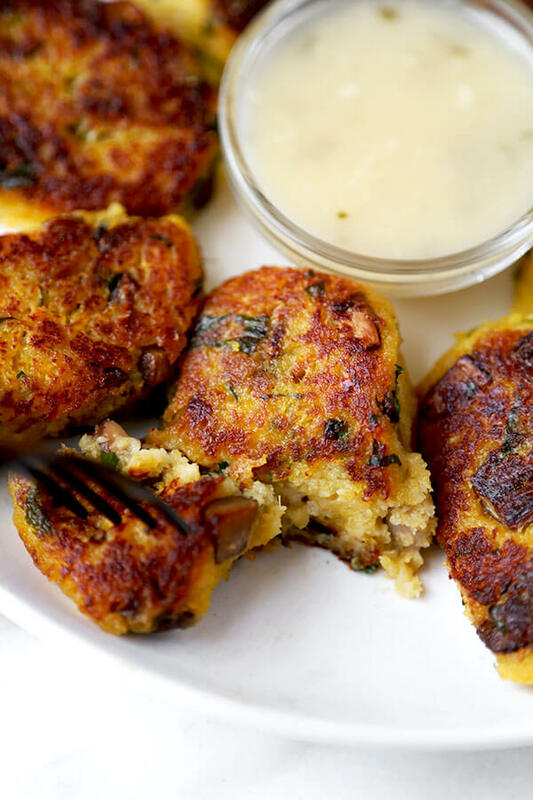 Did you like this Spaghetti Squash Croquettes With Lemon Sauce Recipe? Are there changes you made that you would like to share? 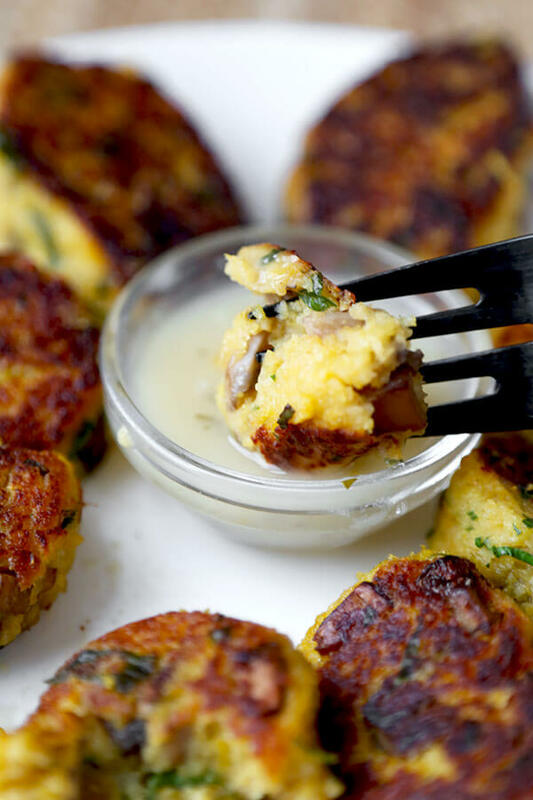 Moist and tender spaghetti squash and mushroom croquettes served with a lemon sauce for the perfect balance of sweet, salty and acidic! 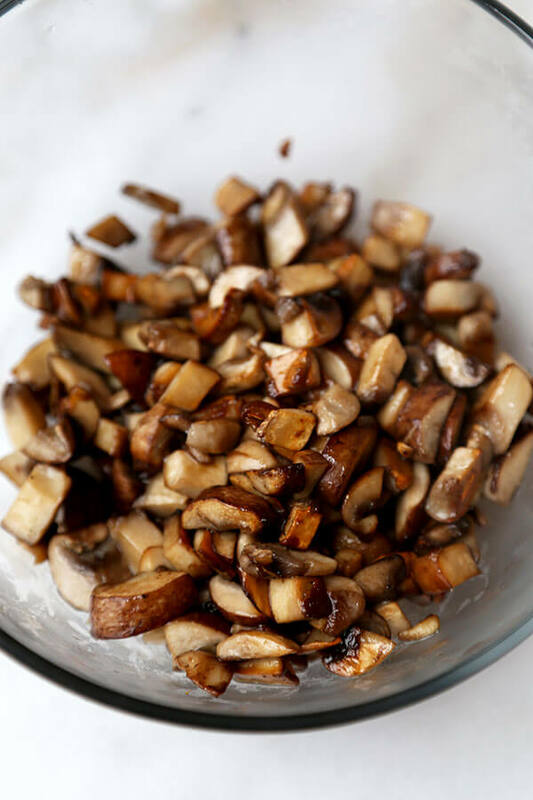 In a pan over medium high heat, add 1 tablespoon olive oil and mushrooms. Saute until mushrooms are golden brown. Season with salt and pepper and transfer to a plate. Let cool to room temperature. 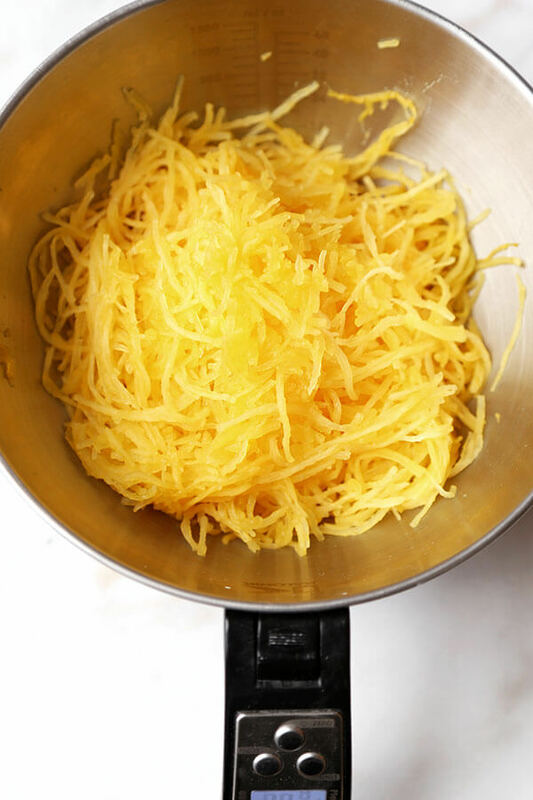 How to cook spaghetti squash: Cut spaghetti squash in half lengthwise. Place spaghetti squash on a microwave safe plate or other microwave safe container. Place the cut side down (skin facing up). Microwave on high for 9 minutes. Take the spaghetti squash out of the microwave and shred with a fork. If the squash is still hard, microwave for another 2-3 minutes, or until tender. 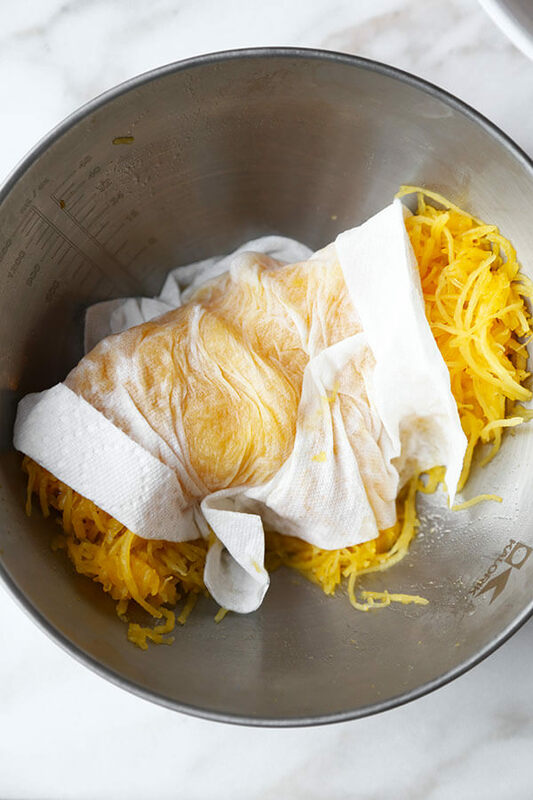 Transfer spaghetti squash strings in a large bowl and squeeze out excess water using a kitchen towel or paper towel. Repeat a few times. 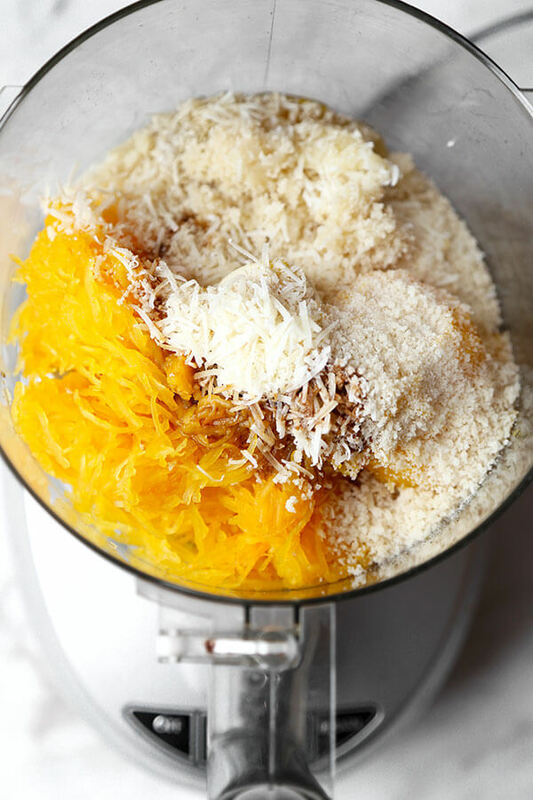 Put spaghetti squash strings in a blender together with parmesan, breadcrumbs, salt, worcestershire sauce and egg. Pulse until all the ingredients are blended – do not over blend. 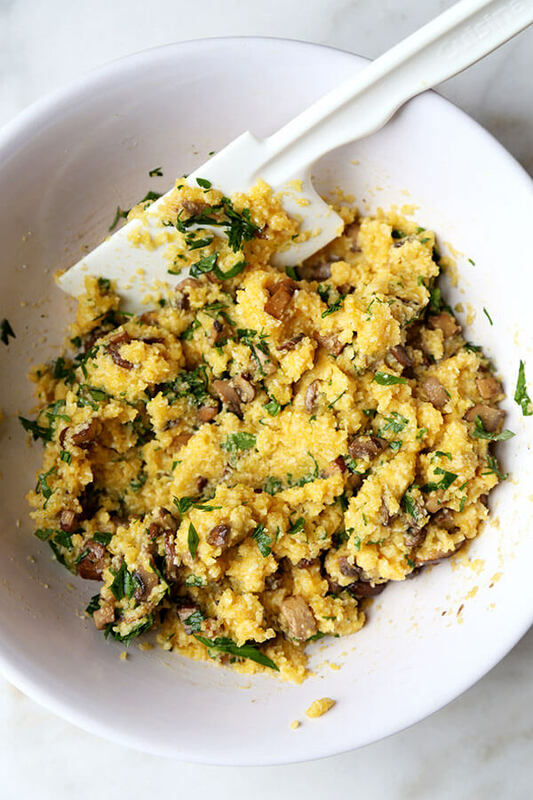 Transfer mixture to a large bowl and add mushrooms and flat leaf parsley. Mix well and using your hands, scoop out the mixture and shape it into 12 croquettes. In a large pan over medium heat, add remaining olive oil and croquettes. Cook on one side for 5-6 minutes or until the exterior is golden brown. Do no overcrowd the pan as it will make it hard to flip the croquettes. Flip and cook the other side until golden brown. Making the lemon sauce: Whisk all the ingredients in a small pot and bring to a boil. Continue whisking until the sauce thickens. Turn the heat off and transfer sauce to a bowl. 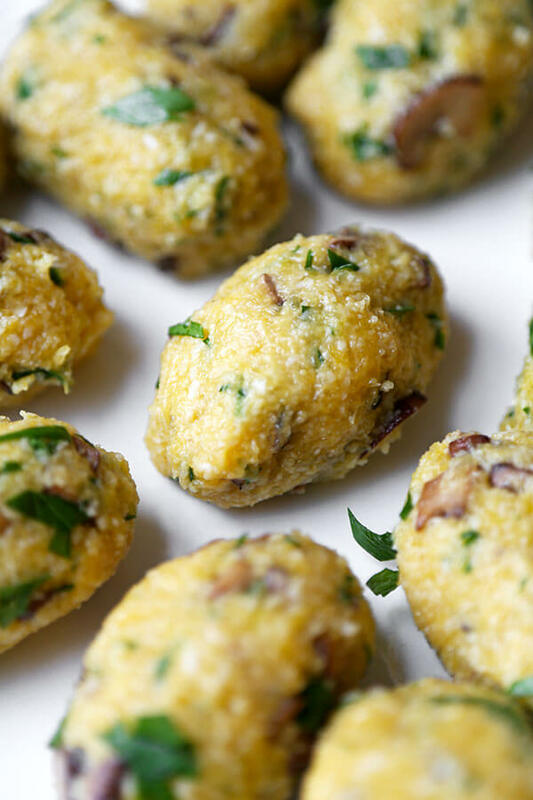 Serve together with spaghetti squash croquettes. 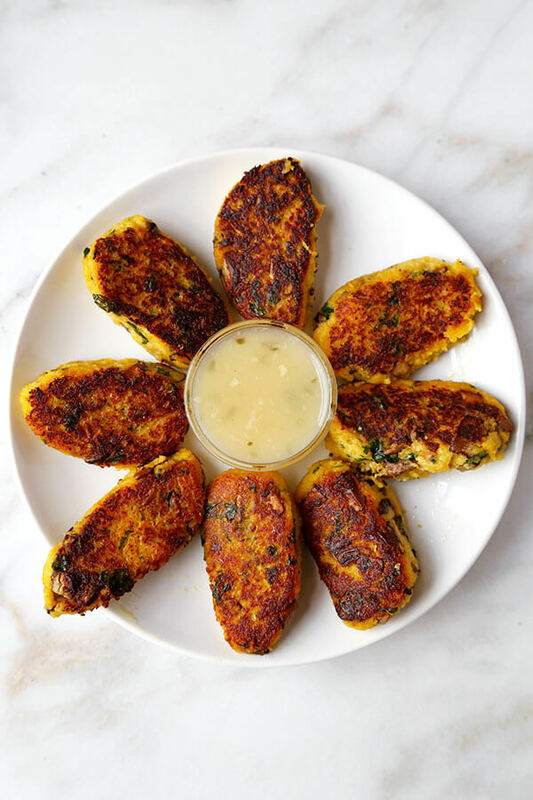 Condiments such as mustard, ketchup and mayonnaise also pair well with these croquettes! Hi Caroline. Since I don’t eat meat or dairy can I sub the Parmesan for nutritional yeast? Do you think it would work or should I try a different sub? I think you can totally use nutritional yeast! We often substitute cheese for nutritional yeast (as you know, we’re not big dairy eaters either 🙂 ) and it’s worked pretty well in all the recipes. I would recommend using 3 tablespoons or so. If you do, can you let me know how much you used and how it turned out? Thank goodness for spaghetti squash. Saving my low carb diet one amazing transformation at a time! 🙂 Cannot wait to try these! What a fantastic, fun way to get more veggies into your diet! I think even my picky kids would go for this. Your Ben sounds a lot like my Phil, and I love it that you also take ingredients that your hubs roundly despises and turn them into dishes that he actually LIKES. Well done!